Braving the morning chill, the students and staffs came out with full force to pay homage to the founding fathers of the Constitution of India. The function began with the unfurling of the National Flag by the chief guest, Hon’ble Justice K. N. Bajpayee followed by the singing of the National Anthem. Thereafter, College Captain Laksh Kawatra took the pledge on behalf of the students. Harsh Gaur and Pratyush Mishra, both of class XII delivered speeches in English and Hindi respectively highlighting the importance of our constitution. A lively cultural programme was organized by the students. Patriotic song ‘Takat Watan ki humse hai…’ by class III and IV was appreciated by everyone. HTS choir presented a song ‘Chalte Chalo…’ Folk dances of India was jointly performed by students of Nursery to class IV and put all the colours of our nation. A patriotic song “Khil khilate Haste Gaate” was well sung by the school choir. 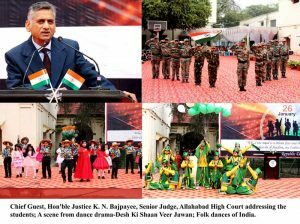 A dance drama “Desh ki Shaan – Veer Jawan” presented by the students of class V to VIII portrayed the love and sacrifice of our soldiers. 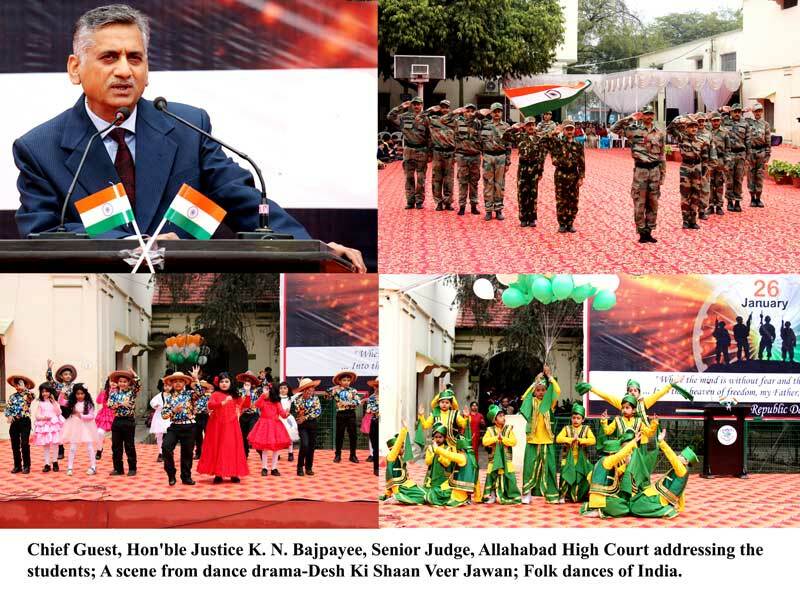 In his brief address, Mr. Justice K. N. Bajpayee enlightened the students about the significance of the Republic day and how our Constitution protects the fragile fabric of our society. He dwelt upon the working of the Constituent Assembly and the vision of our Constitutional forefathers. He thanked the Principal, Mr. D. A. Luke and the management of the school for giving him an opportunity to interact with the future of this country. He said that he was reassured that this nation is in safe hands. He appealed to the students to be concerted in their efforts, to remain discipline and humble and success in life will follow. In the end, he appreciated the efforts of the teachers and students for putting up flawless cultural programmes apt for the occasion. Earlier the BHS Principal, Mr. D. A. Luke welcomed the chief guest and teachers and accorded a warm greeting for the Republic Day. The function was conducted by the College Section In-charge Mr. L.A.M. French.